Luz Gabás was born in 1968 in Monzón (Huesca). After spending a year in San Luis Obispo (California), she studied in Zaragoza, where she graduated in English Literature and later became a professor at the University. For years she has combined her university work with translation, writing articles, literary and linguistic research and participation in cultural, theatrical and cinematic projects. 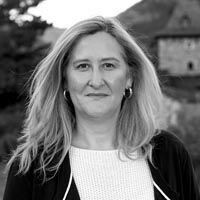 She moved to the beautiful town of Anciles in 2007, living next to the Benasque villa, where she now spends her time writing, amongst other activities.